I just had the best evening drinking wine and eating licorice while reading Cat’s Cradle. Kurt Vonnegut is damned fine company (I’m gonna refer to him in the present tense because being a great author makes you immortal). The way he takes care of his audience is what makes reading every sentence he writes such a pleasure. It reminds me of all the capable authors I’ve read whose stories just don’t grab me because they fail take Vonnegut’s most simple writing advice: “pity the readers.” Storytelling is not all about the author; it’s about the audience. You can have the greatest story in the world but if you don’t tell it in a way that fully engages the minds and hearts of your readers, it’s not going to work. 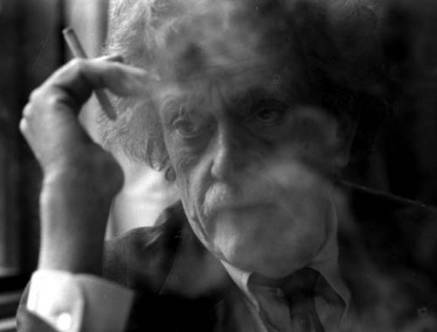 In Vonnegut’s fiction, his attitude translates into super-sharp and precise descriptions that do a massive amount of work in a short time and space. There’s no flowery prose and no dancing around what he wants to say; he just knows how to choose the right words to give you an insight about the character, the narrator, and often even universal truths about being human. Here’s a few of his lines I love for their multi-level awesomeness. To shift the structure of a sentence alters the meaning of that sentence, as definitely and inflexibly as the position of a camera alters the meaning of the object photographed. Many people know about camera angles now, but not so many know about sentences.